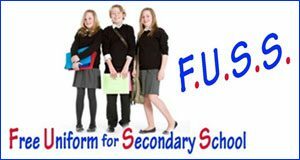 FUSS – Free Uniform for Secondary Schools. What is all the FUSS about? It is a very simple idea which benefits everyone involved. Schools can donate their unclaimed lost property and families can donate second hand items of uniform. All the uniform is either new or good quality. All second hand items are fully laundered and ironed. The charity has a website www.wirralfuss.co.uk where items can be searched for and reserved.